We found these awesome dish and pot protectors that keep your kitchen wares from clanking together, vibrating or damaging surfaces. Oh, and they’re even more fun because they come in bright and bold colors. These are a necessary commodity in packing up your kitchen! Oh, and they also make a fun gift for your favorite RVer or Camper! Wine and booze is not cheap, we all know that! Well, protect your bottles of bubbly, reds and spirits! Alcohol bottles are delicate! 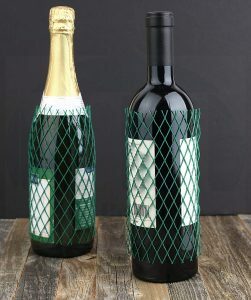 Get great bottle protection with these mesh sleeves. Keep your liquor and wine bottles safe in the bag during transit. These thin polypropylene sleeves fit perfectly over your bottle to create a protective buffer that prevents the glass-on-glass action that causes breakage, when bottles travel together. You can even use these on your drinking glasses, Olive Oil and Vinegar bottles. You’ll need a lot of these if you want to keep your glass quiet. Any which way, these make great packing essentials that store just as compact as you need them. If you’ve been on the road awhile, you’ll know to be really careful when opening any of your cabinets; especially those overhead. 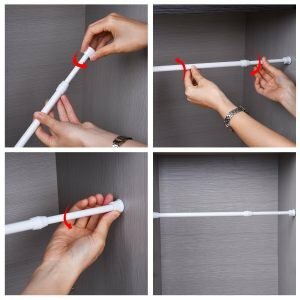 We’ve bought a bunch of cabinet spring rods to expand and insert inside each cabinet to prevent the contents from falling out when we open them. We recommend measuring the insides of your cabinets to make certain you get the correct size. We also use these in the refrigerator! And, in our front clothes closet, we install them vertically to keep our stacks of clothes on the shelves instead of tumbling down into a pile on the closet floor. 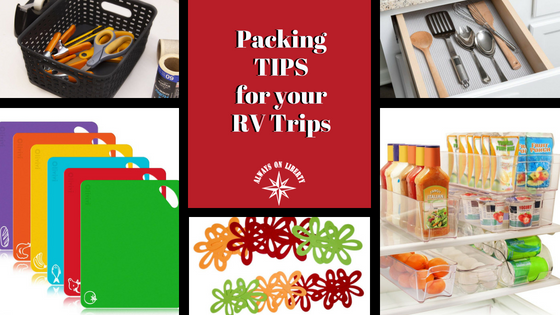 Put these on your packing list! When we’re pulling your down the road, you’re going to notice that some of the contents in your cabinets and drawers may slip and shift. We found our remedy is this rubber mesh shelf and drawer liner. This is a non-adhesive shelf liner that features a non-adhesive grip top and bottom. 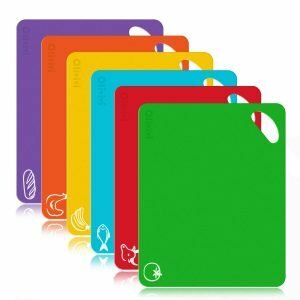 It is ideal for under electronics, small appliances or accessories, or inside shelves, drawers, placemats or coasters. This shelf liner has a consistent uniform pattern and offers more cushioning. This shelf liner is simple to cut and install and is machine washable. We also use it under trays, our air fryer, and lamp to keep them stable. Sometimes, we need a solid surface blocker to insert inside our cabinets to hold back tall households. One day, I had taken our plastic cutting boards and slid them inside my upper cabinets holding our spices and drinking glasses. They were perfect because though they are made of a thick plastic, they are also flexible to bend slightly to place. No more stuff crashing on my head or face when I open the cabinets! 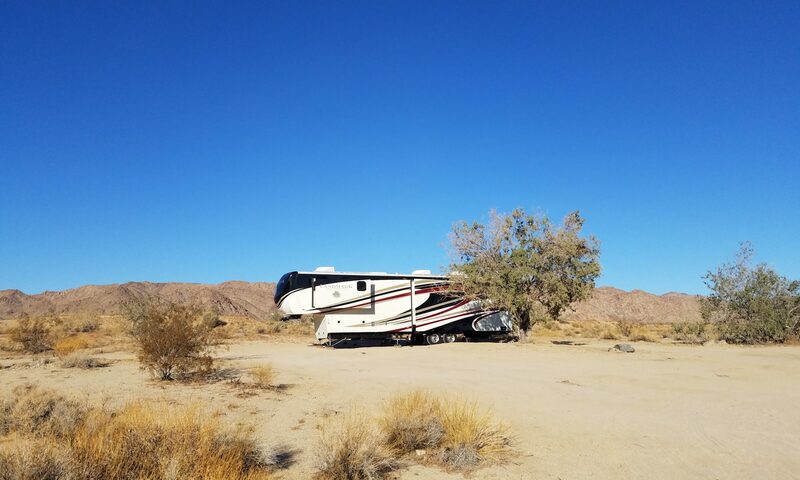 Our first RV transit was an utter disaster! Ketchup, salsa and a dozen eggs flew out when I opened the refrigerator door! I had to find a way to keep our reefer contents safe and secure. 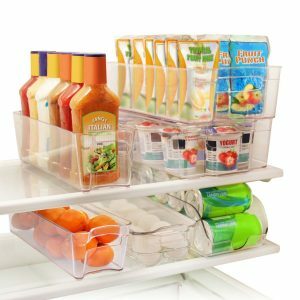 Then, I found these awesome refrigerator and freezer stackable bins! Now, everything is kept intact when we go down the road. To make certain they don’t slide around, I covered the shelves with this grippy refrigerator shelf liner. In our pantry, we have small pantry baskets that we store bags or boxes of non-perishables in. Everything stays in its place, even when transporting on the bumpiest roads. 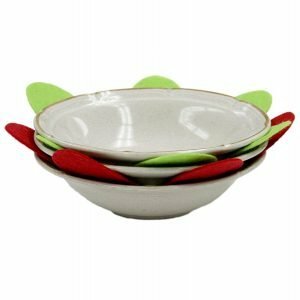 They are great for storing gravy and dip packets, small soup boxes, pasta packages, etc. You can never have too many baskets and organizers in the cabinets. So, as you see, sure, you can go without all these things. Others have done it but these are great tips that have worked for us that we’d like to pass on. 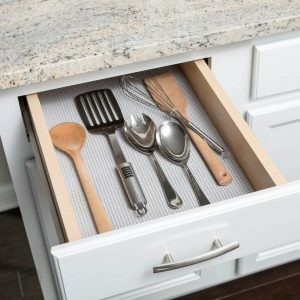 It surely makes life easier knowing all your stuff isn’t going to tumble out of the cabinets or refrigerator causing injury or cost a lot of money.